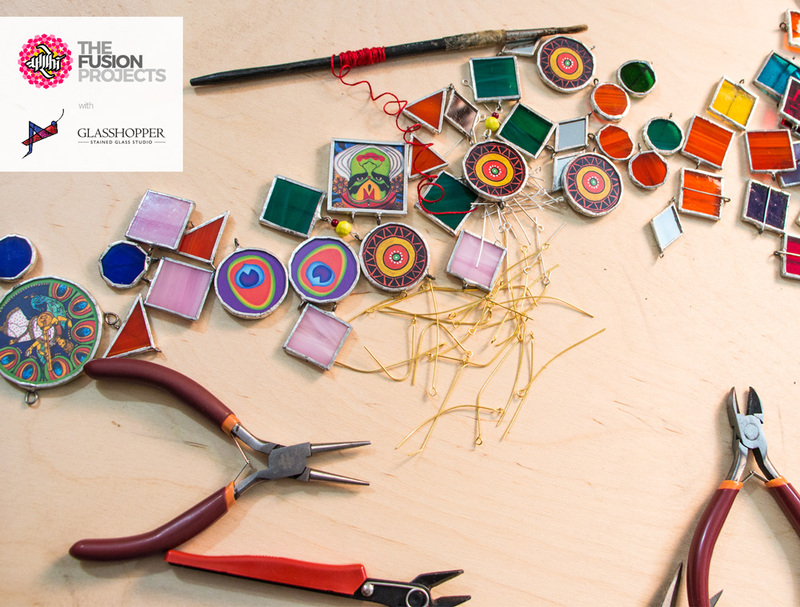 The first in the series of The Fusion Projects is with stained glass studio – Glasshopper. It’s been 6+ months in the making but the thought actually has been brewing in my mind for almost four years. But the jewellery had to be different and yet be universally appealing. I could have worked with a regular silver/gold smith to make the pendants but then where is the fun in that? Enter Saarus Nirhali – my friend and a wonderful stained glass artist. Saarus works with glass but on a much larger scale. 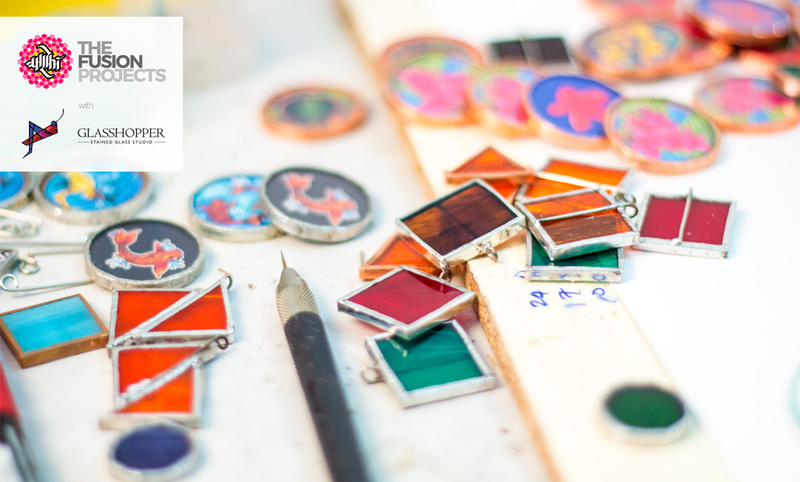 So to work on one square inch pieces meant she needed to rethink her entire approach to her own work! The challenge for her was to get a fineness in the edges and edge finish. She needed to see the potential. I have to say. Saarus was ready for the challenge. The pieces are truly wonderful even if I say so myself. 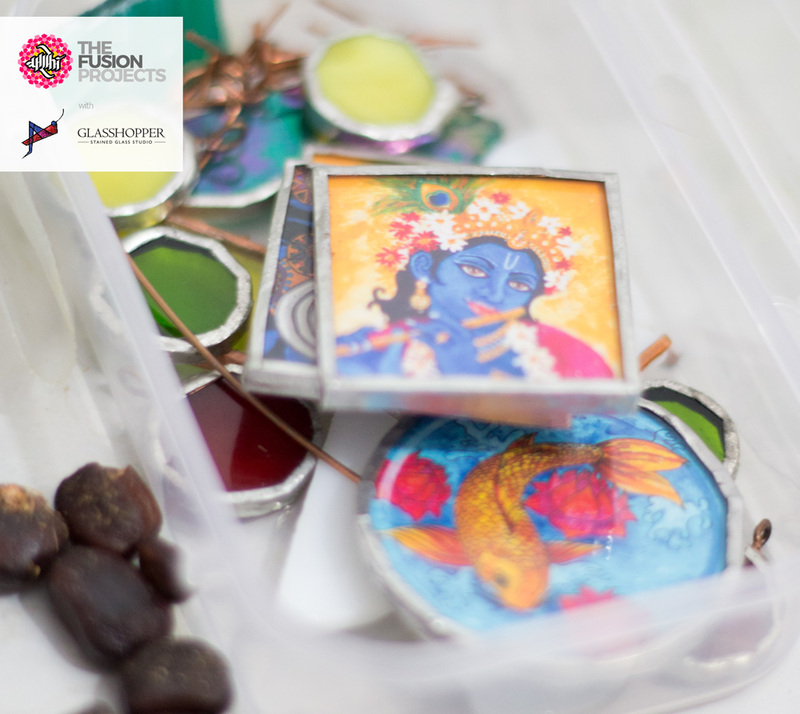 At ArtByAarohi I have always tried to push the envelope a little, to blend material and media. To add an element of up-cycling or recycling. An element of surprise. This collection too has a little bit of that. Gold and silver have an innate value irrespective of how good or bad a design maybe. These needed to be good designs! Since neither gold nor silver is being used. The design and finesse had to be something that worked for everyone. Or at least everyone with a certain sensibility. It has been months in the studio, doing, re-doing and refining pieces. There have been instances where a finished necklace has been pulled apart and re-done because the loops on the pendant did not sit right. I am an extremely detail oriented person and would go back to the drawing board when I wanted a piece to be a certain size or the loops a certain orientation. But I think we are now at a level of finish that I am happy with. Our work will only get better from here. The artwork in each piece is based on my original painting. The materials, their use and how the end piece would look has been my work. Saarus on the other hand has worked on encasing the artwork using true Tiffany style stained glass techniques. Her studio has been busy working away at cutting/grinding and then soldering many tiny pieces of coloured glass to fit my vision. The loops on each piece of glass has been a very time consuming and exacting process. I have learnt so much through this collaboration. Not just about stained glass and it’s possibilities/limitations but about working with another individual. Patience was never my strong point but I have learnt it along the way. 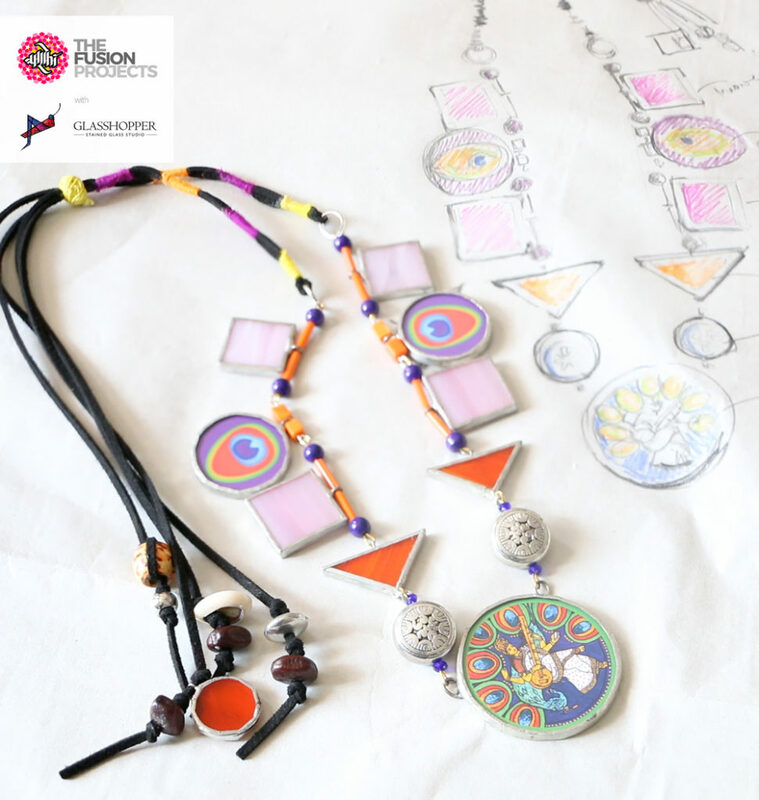 This collaboration has allowed so many wonderful iterations in the ideation process that I can truly say that alone this series of jewellery may not have packed the punch that it does. Please do click here to read Saarus’s experience in the making of this collection. This entry was posted in Acrylics, Event, Exhibition, Graphic, Happy Happenings, Jewellery, Re-use, Re-work, Sewing, The Fusion projects, Upcycle. Bookmark the permalink. Amazing stuff….I did a workshop with Saarus n this collaborative venture is an amazing idea …gud luck !! !